This post is the product of a heated debate. At a recent conference, a colleague mentioned, much too matter-of-factly, that she took a bath in her hotel room. Not a shower. A bath. I had never heard of someone voluntarily bathing in a hotel room. I think bathing is preposterous. Bathing in a hotel room is lunacy. I started asking people to estimate the percentage of people who had ever bathed in a hotel room. The few that admitted bathing in a hotel room guessed 15-20%. I guessed 4%, but then decided that number was way too high. A group of us asked the hotel concierge for his estimate. He said 60%, which I took as evidence that he lacked familiarity with numbers. One of the participants in this conversation, Chicago professor Abigail Sussman, suggested testing this empirically. So we did that. We asked 532 U.S.-resident MTurkers who had spent at least one night in a hotel within the last year to recall their most recent hotel stay (notes .pdf; materials .pdf; data .xls). We asked them a few questions about their stay, including whether they had showered, bathed, both, or, um, neither. Here are the results, removing those who said their hotel room definitely did not have a bathtub (N = 442). 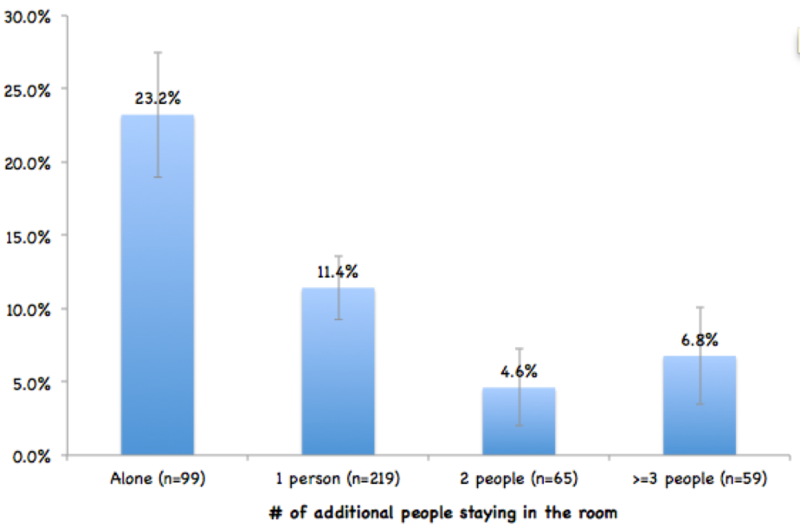 Ok, about 80% of people took a normal person’s approach to their last hotel stay. One in 20 didn’t bother cleaning themselves (respect), and 12.4% took a bath, including an incomprehensible subset who bathed but didn’t shower. Given that these data capture only their most recent hotel stay, the proportion of people bathing is at least an order of magnitude higher than I expected. If you had told me that 12.4% of people report having taken a bath during their last hotel stay, I’d have told you to include some men in your sample. Women have to be at least 5 times more likely to bathe. Right? Women bathed more than men (15.6% vs. 10.8%), but only by a small, nonsignificant margin (p=.142). Also surprising is that women and men were equally likely to take a Pigpen approach to life. 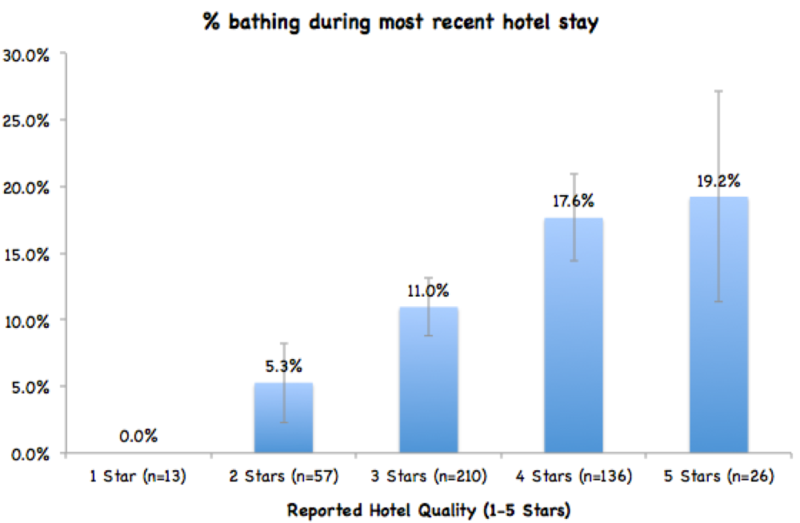 Hotel quality: People are more likely to bathe in higher quality hotels, and nobody bathes in a one-star hotel. Perceptions of hotel cleanliness: People are more likely to bathe when they think hotels are cleaner, although almost 10% took a bath despite believing that hotel rooms are somewhat dirtier than the average home. Others in the room: Sharing a room with more than 1 person really inhibits bathing, as it should, since it’s pretty inconsiderate to occupy the bathroom for the length of time that bathing requires. More than one in five people bathe when they are alone. We also asked people whether they had ever, as an adult, bathed in a hotel room. Making a mockery of my mockery, the concierge’s estimate was slightly closer to the truth than mine was, as fully one-third (33.3%) reported doing so. One in three. Finally, we asked those who had never bathed in a hotel room to report whether they’d ever consider doing so. Of the 66.7% who said they had never bathed in a hotel room, 64.1% said they’d never consider it. So only 43% have both never bathed in a hotel room and say they would never consider it.